My friend Kathy's Icelandic horse Aska produced twins, a black and white filly named Systir and a grey and white colt named Bróðir on July 1st of this year. Despite the odds, both mare and twins survived and are thriving. Here is a link to an article on them with pictures. The article, which I wrote, also highlights the great danger that having twins represents to both mare and offspring. The horse uterus is not designed to carry twins. 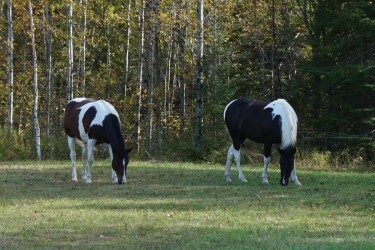 Northwest Horse Source just put a gallery of photos that they took of the twins for the Newspaper Article. The cuteness factor is exponential. wow! That's amazing! Sounds like she worked really hard to ensure survival for the mare and both offspring! Thanks for posting this. It was such an interesting article. And, of course, the video was so dang cute! Wow, so glad they both survived! What cuties they are. So wonderful to see that they are both doing so well! Kudos to their owner. Nice article, Pam, and cute twins! wow, what a fighter that little guy is! So very glad he was able to be helped. When I interviewed the vet for the article, Dr. Beckman said one of the reasons for Bróðir's survival was the passion and dedication that Kathy provided in foal care. Interesting synergy, Dr. Beckman's daughter had twins just after he helped with the horse twins. I'll try to get Kathy to post more videos of the twins. They are just so dang cute!!!! Well done! A lady who breeds RMH's a few hours away, had a set of twins this year, and worked VERY hard to keep them both healthy. And they both made it! Here is a link to a more recent video. Iceland foals tend to grow a really thick winter coat. These little guys aren't really as pudgey as they seem. The twins are so cute. WOW, what an adventure for that horse owner! Glad to see the babies are doing well...so cute! Please share the next update when comes out. Twins have occurred a couple times in Mountain Pleasure horses and about 10 years ago, twins were born to a Standardbred mare a few miles from where I live. The MPH twins were strong and equal in size from the start. The Standardbred story was similar to these Icelandic twins. Thanks for the update on the twins. They are so stinking cute!!! There is so much negative and sadness on the internet, it brings me so much joy to see this happy ending.. Smiling big this morning! That was the sweetest thing to watch. What a little spit fire pushing the way in to feed near the end. They are so cute. So happy for the owner. Tooooooooooooooo cute. Some people are like dark clouds--when they go away the sun comes out.